Successfully Added Fingerprint Door Lock Sleek (Left) to your Shopping Cart. 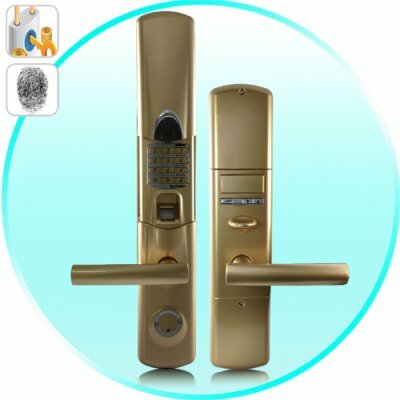 Unique Fingerprint Door Lock for the latest in business security and safety. A heavy gauge, all-metal door entry protection biometric door lock for use when only the highest quality security system is acceptable. If you need the presidential level protection and won't settle for anything else, look to the CVPW-J30 Fingerprint Door Lock. Heavy Duty: The tremendous size of the fingerprint door lock only symbolizes the amount of responsibility it can handle. The CVPW-J30 can handle whatever you throw at it and was meant to guard the most important locations like Government Buildings, University Labs, High-Tech Headquarters and Campuses, Banks, Executive / VIP Rooms, and Military Facilities. If someone was not meant to have access, then this heavy duty fingerprint lock will make sure it stays that way.